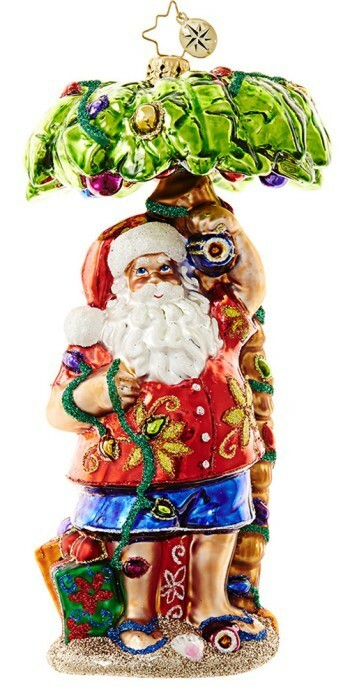 This Radko Christmas ornament features a radically cool Santa hitting the beach for a little R&R after the holidays. It’s a Radko Santa ornament for dad, grandfather or that whacky brother that plays Santa for all the kids. This Radko glass ornament is beautifully detailed European handblown glass with amazing detail from palm fronds to Santa’s flip-flops. It works well as a beach ornament and travel ornament to commemorate great moments in tropical locales. The Caribbean breeze Santa chillin’ on the beach personalized Radko ornament will arrive with your custom information lettered by hand to create a one-of-a-kind Santa ornament. Make someone’s Christmas more jolly with the Santa palm tree Radko Christmas ornament that will be the highlight of the season.